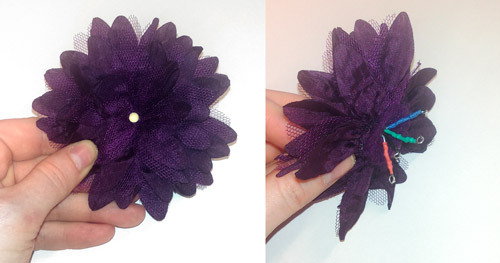 Create a one of a kind corsage that can change color to match your ensemble! 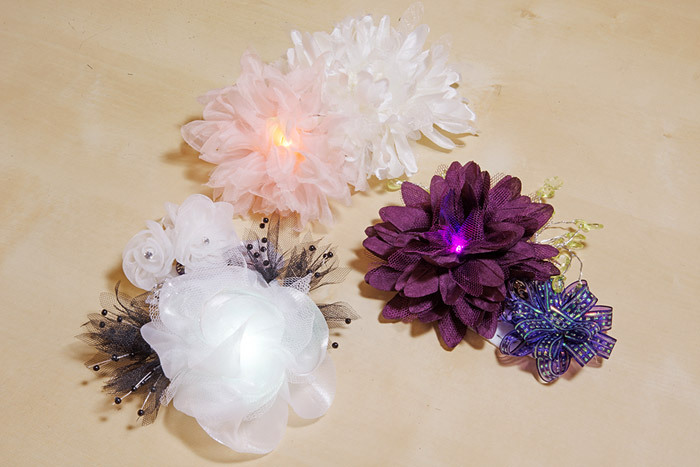 This project explores one option for creating an accessory with the Silk Flower LED - an organza flower with a built-in common cathode 5mm RGB LED. 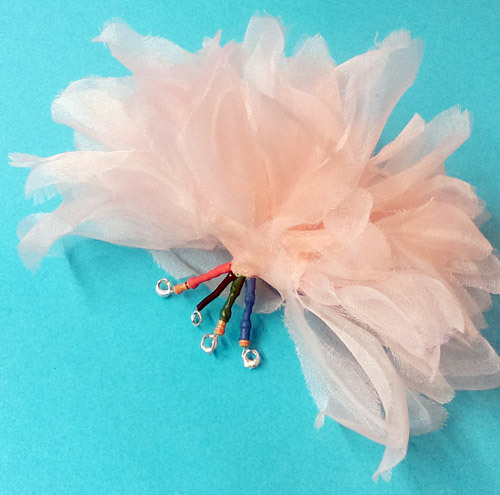 We'll be showing you how to make a corsage with it, but this circuit could also be built into a headband, brooch, or other small accessory. 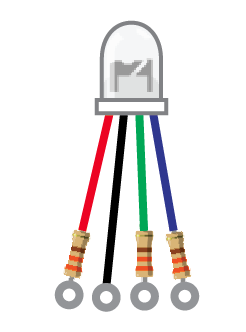 We'll be attaching a switch to each powered leg of the LED - red, green, and blue - to control them individually. This allows us to mix up to 7 colors - red, green, blue, yellow, cyan, purple, and white - depending on the combination of switch states. 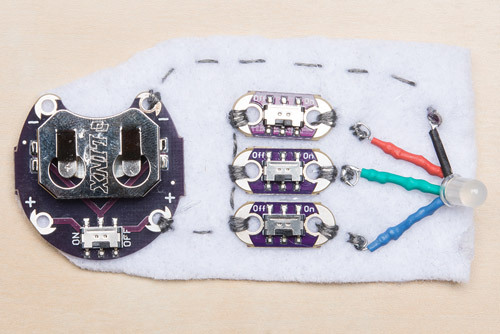 Note: This is an e-textiles project, but we'll be soldering to prep our LED for sewing. If you don't like the look of this particular silk flower, you can also craft your own by gluing a 5mm common cathode LED into a silk flower of your choice. 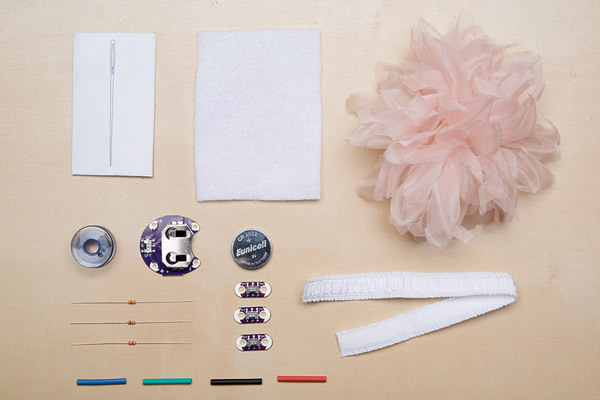 Check out our wishlist for the DIY flower version. This process will be the same for both the pre-made silk flower and a bare RGB LED. 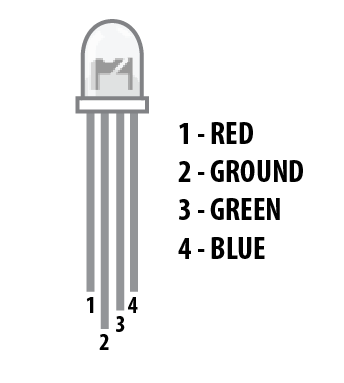 Before we do any soldering, we'll have to keep track of which legs on the LED go to which color in the LED. This is a common cathode LED, meaning all 3 LEDs inside share one ground wire. Find wire 2 (the longest wire) - this is the ground wire. Gently bend the wires away from each other so they are easier to access when soldering. To help us keep track of the wires and insulate them from accidentally touching when we sew our circuit, we'll be using different colors of heat shrink tube. Make sure to choose a heat shrink tube that will fit easily over the resistors. If you don't have heat shrink, you can also wrap electrical tape tightly around the wires or paint them with white liquid electrical tape and color with permanent markers after soldering. Cut a small piece of heat shrink that will cover all but the last 1/4" of wire and slip it over the GROUND wire. 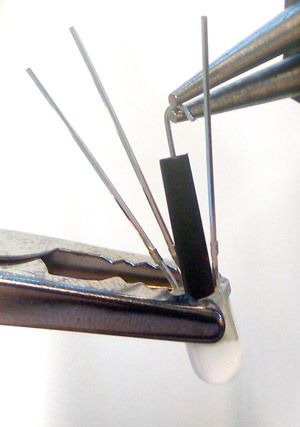 Use a pair of needle nose pliers to curl the end of the wire into a loop. Double check that the loop is big enough for your needle and thread, then solder closed. Now we have an easy to sew loop for attaching the wire to our conductive thread. Finish the process by setting the heat shrink - use a heat gun or hold the side of the soldering iron close to (but not touching) the tube until it shrinks around the wire. We'll repeat the process with the other three LED legs, but this time we'll attach a current limiting resistor. Feel free to clip the LED legs a little shorter at this point since the resistor will add some additional length. 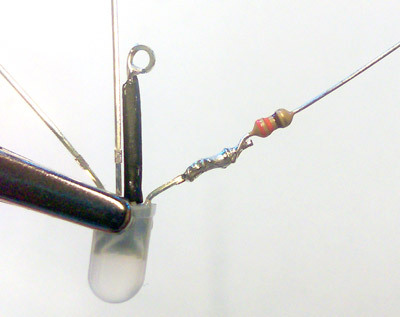 Wrap one wire of the resistor around a leg of the LED. Solder the two wires together. Then cover both the wire and resistor with a length of heat shrink. Bend the remaining wire on the resistor into a loop and solder closed. Finish by setting the heat shrink. We used heat shrink colors that match the LED - red, green, and blue. 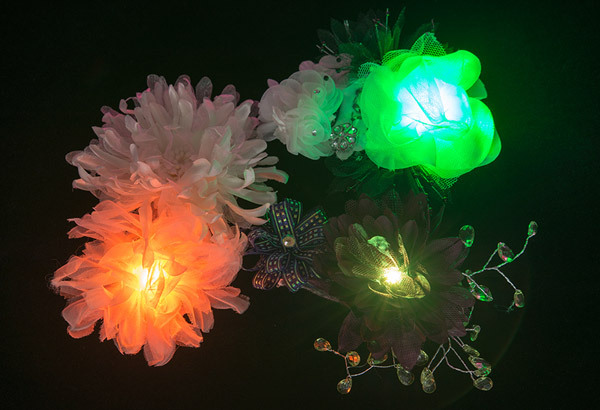 To create your own LED flower, carefully cut a hole in the center of a fabric flower and glue the LED in place. Time to put our circuit together. Cut a piece of felt big enough to attach all the components, approximately 2" x 4". With conductive thread, attach all components as shown in the diagram. Make sure to leave enough space so that thread paths don't accidentally touch each other. 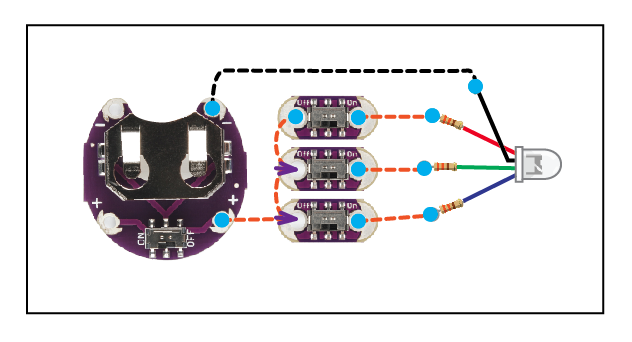 Each LED will connect to a LilyPad Switch to turn them on/off. The other sides of the switches connect to the positive hole of the battery holder. The ground wire of the LED connects to the negative hole on the battery holder. 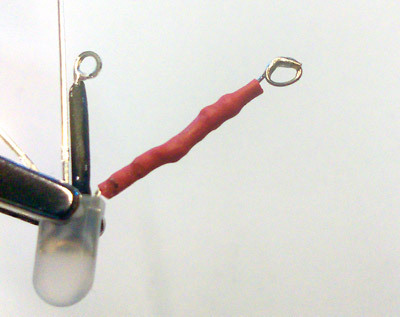 You will need to carefully bend the ground wire over across the red LED wire towards the top edge of the felt. To keep components from moving around while you sew, use a dab of hot glue to stick them to the felt. Make sure to loop 3-4 times through the hole on each component for a secure connection. 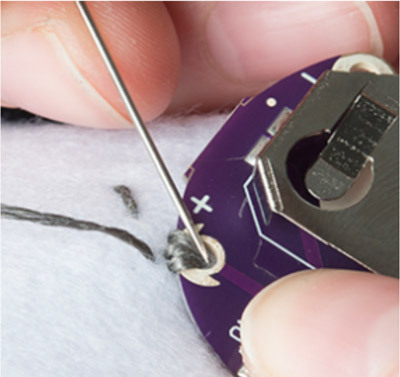 For more tips on sewing with conductive thread, check out this tutorial. 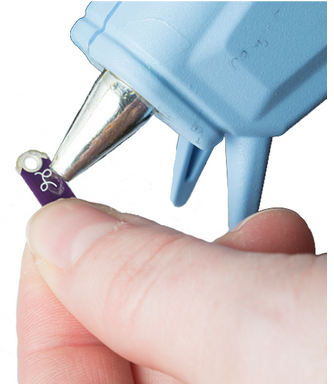 Once all your stitching is done, insert the coin cell battery, and test out your circuit. Try each switch to see the combinations of colors you can create. To finish the project, measure a length of elastic ribbon that will fit comfortably around your wrist, and hot glue to each end of the felt. Embellish with additional flowers, ribbon, or other decorative accents to hide the switches and battery holder. Make sure to leave access to the switches and enough room to slide the battery in and out of the holder. As added protection for the thread and for comfort while wearing, line the back of the project with a scrap piece of fabric or cover the conductive thread with a thin layer of hot glue.